“I perceive,” I said calmly. “It’s the unfettered impulse of a lofty soul breaking the tyrannizing bonds of custom.” And I turned toward him. As he absently tied the poker into hard knots with his nervous fingers, I watched him with some interest. “Fearful! Call you this fearful? Ha! ha! ha! Look! you wretched little atom, look!” and he dashed forward, and, leaping out of the window, stood like a statue in the pelting storm, with folded arms. He did not stay long, but in a few minutes returned by way of the hall chimney. I saw from the way that he wiped his feet on my dress that he had again forgotten my presence. “You are a governess. What can you teach?” he asked, suddenly and fiercely thrusting his face in mine. He seized a heavy candlestick, and threw it at me. I dodged it submissively but firmly. There’s a giant ‘negress’ dancing around his bed for awhile- Miss Mix is told this is his ‘first’ but then he throws his boots at her head and that’s an end of that. And then he robs all of his guests and threatens to kill Jane- I mean Miss Mix if she doesn’t help him. They tie everyone up, he lights the house on fire and proposes to Miss Mix in the glow of the flames devouring his THREE crazy wives (and a bunch of other people). Phew… that’s all I can say. When, after her death, I went to her house in Clapham and pulled out the drawers of the filing cabinet in which she kept drafts and discards of her work, I hoped to find some unpublished stories, or notes on the novel about Jane Eyre’s stepdaughter for which she’d submitted a synopsis: Adele was going to fall in love with a schoolteacher, seduce her own father and watch her mother being guillotined; it was going to play ‘some tricks with history … But then it is a novel’. What is that supposed to mean? I’m not a professional writer but I have always found the importance of historical accuracy stressed both by other writers and by readers. But… Adele seducing her father? Why do so many adaptations of Brontë novels have to be so ludicrous? I’ve heard of one in which Mr Rochester’s son is older than Mr Rochester- if you do the math but- really, this is a novel so anything can happen I suppose! You may read the rest of the article here. I’ve never heard of Angela Carter, but I hope she came up with better plots than this. 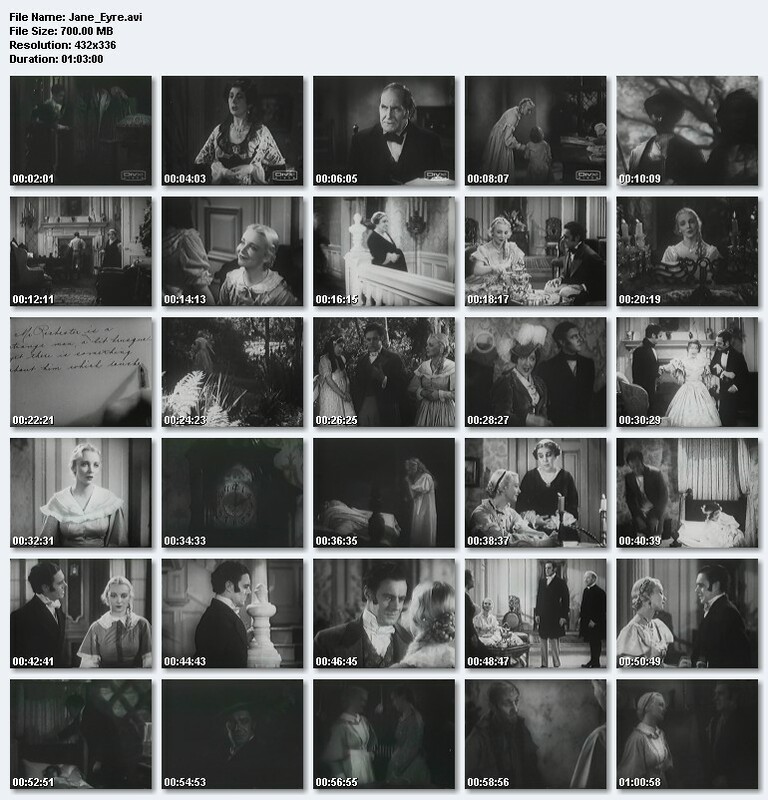 The version available for download (or purchase for $5.00) stars Virginia Bruce as a very blond, very un-quakerish Jane Eyre, and Colin Clive as the meek, soft spoken master of Thornfield- you know? Mr Rochester? Just about everyone I’ve talked to about this film hates it, but I find it cute and very interesting. I think it is not so much a film adaptation of the novel as a film adaptation of plays of the novel! When I’ve read a few more of these plays I will return to this idea to see if it is really supported by the texts. 1934- Jane tears down the burning curtains and smothers the flames with her feet, then she wakes Mr Rochester. 1944- Jane wakes Mr Rochester who vigorously smothers the flames while Jane rushes in with water. 1970- Rochester puts out the flames. 1973- The fire is still burning at “Is there a flood?” Jane and Rochester are shown putting the rest of the flames out together. 1983- Mr Rochester puts out the flames while Jane stands by looking scared. 1996- The fire is still burning at “Is there a flood?” Mr Rochester puts the flames out himself, but Jane has cut her hands on roses from a vase she emptied. 1997- Mr Rochester puts out the flames. 2000- (the musical) Mr Rochester wakes up just in time to see the flames go out. Jane smothers some flames on her nightdress hem. ETA: 1970- Mr Rochester and Jane put out the flames, but Rochester is shown for most of this scene with Jane getting a few shots. 1997- Jane wakes Rochester then watches him put out the flames. A CORNER of Scarborough’s past fired the childhood imagination of Susan Hill and helped turn her into a leading writer – she even used it as a setting for one of her short stories. Now the children’s author and playwright has been horrified by plans to turn the Wood End Natural History Museum, which once belonged to the Sitwell literary family, into a suite of offices from April. Ms Hill was a frequent visitor to Wood End in the 1940s and has fond memories of the conservatory put up by Sir George Sitwell to house his tropical plants and trees, populated by parrots and canaries, and the goldfish pond in the middle of the house. Years later she wrote a short story about it, called In the Conservatory, while the Sitwell Room has also played on her creative imagination. “Scarborough was my growing up town and has haunted my imagination ever since, especially that house and that room,” she added. But comparing the building with the Brontë parsonage in Haworth, West Yorkshire, and calling for a campaign to “save” it, has got her into a “ding-dong” with local conservationists, who argue that the proposed Creative Industries Centre is the only way of preserving the fabric of the structure. The only concern of Scarborough Civic Society is that some public access is ensured to the Sitwell Room – possibly by having open days. Society chairman Roger Foster said: “It is all very well mentioning the Brontës, but there are 200,000 visitors a year to the Howarth [sic.] Parsonage and I very much doubt we have 200 visitors a year to Wood End. Okay, one bit of commentary. Jane Eyre and the Wife of Bath in the same sentence… More information on Michèle Roberts can be found here at her BBC profile. 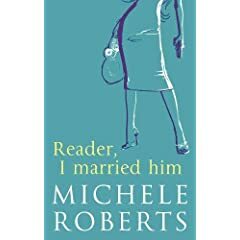 Reader, I Married Him is available here from Amazon.com. When Wuthering Heights is a Punchline! Self-appointed experts need to be brought down to earth by being shown what a " technological benefit" really means at the user level. For instance, I recently overheard a conversation between two businessmen, one of whom appeared to be staring for a long time at his handheld. The other man asked: "Is that WAP?" The first replied: "No, Wuthering Heights." Brontë Answered by the Deep South From a Blogcritics review of the DVD 'Other Voices, Other Rooms.' There's something about certain depictions of the American South of the 1920s and 30s that reminds me of 19th century gothic/romance novels. I don't know if Brontesque is a word; as in reminding one of Wuthering Heights and Jane Eyre, but the air of mystery and gloom that seems to surround old decrepit plantations certainly can give the moors a run for their money. The South may lack the fogs and crags for people to get lost in or fall down, but it has its own share of dangers. Mysterious swamps filled with ghosts and spirits ready to steal your soul. Not to mention more down to earth dangers like rattlesnakes whose bite can kill you or bogs that could swallow you whole. Heat and humidity are every bit as oppressive as cold rains and mists, and poor dissipated Southern gentry can have just as many secrets as their brooding English counterparts. Change the mysterious old faithful servants from white to black, and the brick manor house with drafts to a disintegrating pre-civil war plantation house and the transition is complete. In the face of overwhelming evidence, 'Brontë' (adj.) along with its variants: 'Brontëan' and 'Brontësque' should be added to the OED. In Search of the Brontës, but which ones? A mainstay of his column was the fantasy world of Stretchford, a town populated by such grotesques as the excruciatingly trendy Bishop Spacely-Trellis, who eternally exhorted his flock to jettison “outdated concepts such as God, the Saints and the Incarnation”; Jack Moron, the boorish Fleet Street drunk whose bellicose refrain was “Wake up Britain!”; an appalling tribe of Hampstead liberals, the Dutt-Paukers; and not least the ridiculous social scientist, Dr Heinz Kiosk, who would conclude his monologues by protesting: “We are all guilty!” In Wharton’s universe, everyone remembers the famous Swedo-Albanian war; the famous fifth Brontë sister, Doreen Brontë; Stretchford’s beleaguered Aztec community; and the huntin’ an’ shootin’ Ernest Hemingway’s decision to move to Britain’s most virile town, Bournemouth. I thought Doreen was 6th. In case you were not aware, among the many websites devoted to real actual Brontës there had been at least one which is devoted entirely to fictional ones- a site that sounds like: Brontës R Us. It is sadly no longer with us. If it wasn’t for ‘Curious’ I would never have known. I am not a member of the society, and I have no idea where I would get a copy of the Gazette otherwise. I should probably thank Mr.Wilcocks at The Bronte Parsonage E-Magazine Blog as well. I have a feeling that he is responsible for this particular honour!